Developers: iBusVan is now open source and the code is available now! 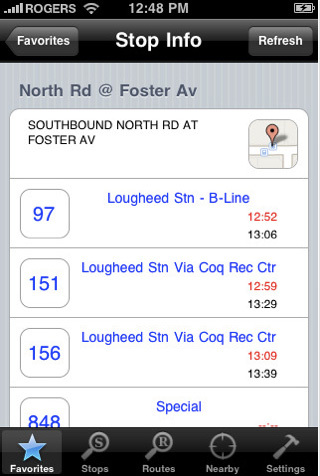 A screenshot from iBusVan, the now-discontinued Vancouver transit iPhone app. A couple of interesting SkyTrain ads! Photo by Alan M.
SkyTrain’s 25th anniversary celebration continues online! Smart card technology will replace our existing ticketing system in 2013. Just a reminder that voting in the smart card contest ends on Friday, January 28, 2011. The animals are dying! Praise Jesus.